At the age of 18, Ma Naijun leaves his family in Beijing to join the Guomingdang army in Shanghai. More than 40 years later, in 1987, Taiwanese authorities announce that they will allow family visits in China Mainland. 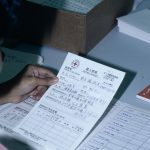 200’000 Taiwanese residents then submit application through the Chinese Red Cross in Taiwan in order to gain access to China Mainland hoping to find their lost relatives. Ma Naijung is one of the 150’000 who have been able to make the journey. His family had given him up for dead, as his sister Ma Shuyi recalls. Ma Naijung’s tracing request was sent by the ICRC to the Red Cross in Beijing and from an announcement in the Beijing paper, his family learned that he was alive and well, living in Taiwan.